Donations to charities are generally classified as “unsought” goods in marketing principles textbooks. This means that many consumers will not deliberately seek out charities to donate to, as there is usually no direct benefit to them. Therefore, like any unsought good product, charities need to be quite proactive in their marketing tactics and will generally need to employ direct marketing programs. Image advertising alone is unlikely to drive significant donations to the charities. These consumers are not impulsive in terms of their charity donations, as they prefer to donate to as few charities of their choice, usually on a regular basis. These charities are often selected through the consumer’s personal experience, where they may have had exposure or a need for the services of the charity either for themselves, or for a family member or acquaintance. Because they have already organized and selected their charities that they are willing to support, they would be very unresponsive to the direct marketing efforts of any other charity. In other words, they are highly brand loyal and not switchers. 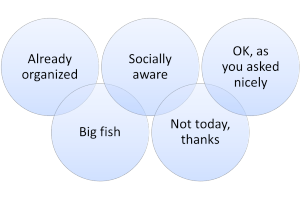 Big fish are the market segment consists of wealthy individuals or corporate executives. They are a common target for all charities as they have larger amounts of money to potentially donate. They are often targeted through conferences, seminars, lunches where there are guest speakers. They were also targeted on a one-on-one basis, whether charity may go through a formal “selling” process. 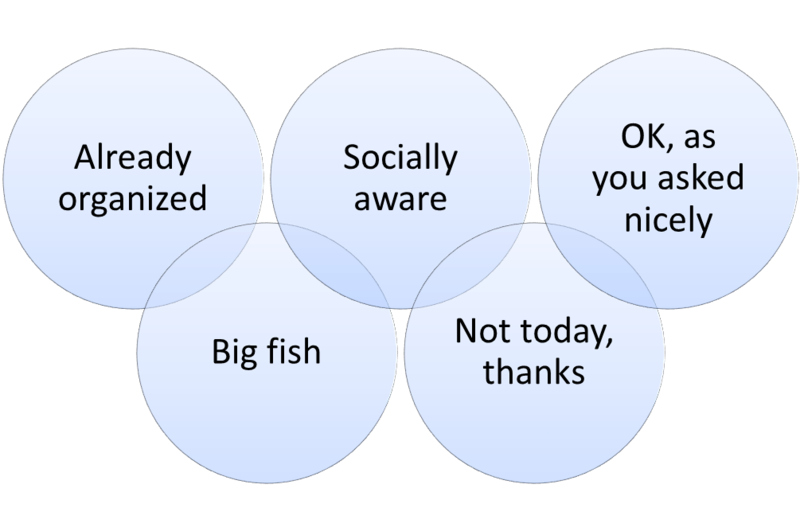 Because they are frequently targeted, many big fish will ultimately end up in the already organized market segment (above), as it becomes easier to put these arrangements in place, rather than to respond to many requests. This market segment, therefore, has a mix of charity brand loyal, as well as switchers. The switchers, however, are more likely to be one-off large donations rather than an ongoing source – requiring consistent marketing efforts. The socially aware consumer group of those consumers who are more thoughtful, yet still impulsive, contributors to charity. When approached through direct marketing programs, they will primarily consider the merits of the charity and are not impressed with high pressure selling tactics or marketing hype. They can be persuaded through rational argument and look for charities that have benefits aligned with their personal values as well as a lean administration cost, so that most of the funds go to the end user. This consumer segment does not generally provide money to charities. This may be due to financial restrictions or simply their personal view of charities. Therefore, they would be unresponsive to any promotional or direct marketing efforts. The final market segment in this example for charities are those consumers who probably do not want to donate money, but that generally quite passive all compliant people. Therefore, if asked directly, particularly in a social situation, they have difficulty saying no and will usually make a small donation. This market segment is generally a consistent giver of funds, but higher cost promotional methods (such as face to face interception) is required – delivering a lower paid back on the marketing activity. Regardless, each segment is quite challenging in its own right and requires a different marketing approach to deliver results.